Today I'm showing you Artform Revolutionary Range #502 Red Gold, which is a dupe of Ozotic Pro #502 which may be close to a dupe of Sally Hansen Prism Ruby Opal (see Splurge vs Save). 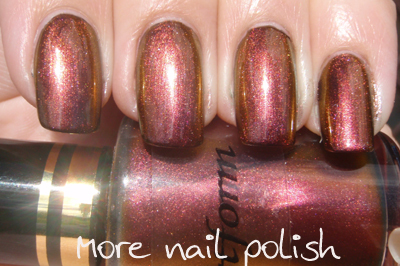 But before swatches I just want to mention a couple of things that annoyed me about my latest order from Artform nails. I noticed on my credit card a week after placing my order that what I was charged was less that what I had ordered. I sent two emails to them asking why my order was costing less, unfortunately I never received a reply. It was only when my box arrived that there was a hand written note on the invoice that said some polishes were out of stock and they didn’t charge me for them. As their shipping is rather expensive, I really wish they had contacted me and advised if and when they were getting the polishes that were out of stock back in. I would happily have waited to receive them and ship them all together, whereas now, I would have to place another order (including the full shipping price) if I want to get the out of stock items. My other gripe is that a number of these bottles were not full. The green holographic one, and a few of the multichromes have a good 5mm missing at the top of the bottle. What’s with that!! Despite these two issues, I am really happy with the polishes I have got. 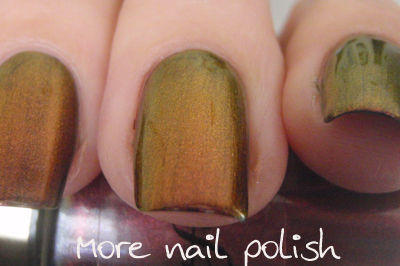 #502 is another multichrome with colours shifting through from a burgundy crimson through to gold. This is three coats over a black base. This one was the first I swatched, and I didn't capture it as well as I have the others. 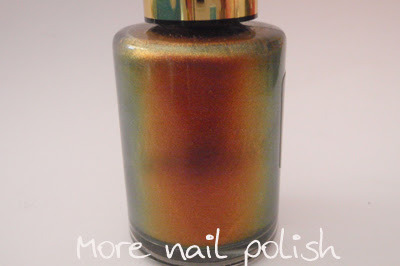 There is a real knack to photographing duochrome polishes and I certainly got better the more I took. ^What she said, love it!